The stone axe had an important role as tool and weapon in the Neolithic. As a symbol stone axes are found as carvings in several passage tombs in Brittany. Hafted axes are found for example in: Man� Kerioned, Kerran, Man� Lud, La Table des Marchands, Manio and others. Axe engraving in the cap stone of the Table-des-Merchands tomb, Locmariaquer. In Britain carved axes on Megalithic structures are rare and only two places are known: the central stone of the Boscawen-�n stone circle in Cornwall and the carvings in Stonehenge. 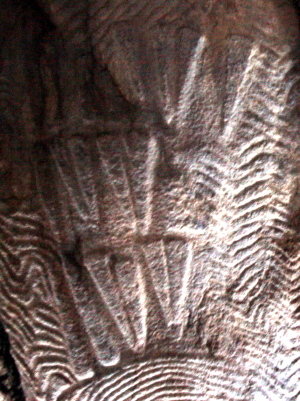 Axe engravings in the slab stone of the Gavrinis tomb. Shee Twohig [SheeTwohig81] argues that axe carvings in Breton tombs are often found together with bow carvings in the antechamber and could have had a kind of �guardian� function. 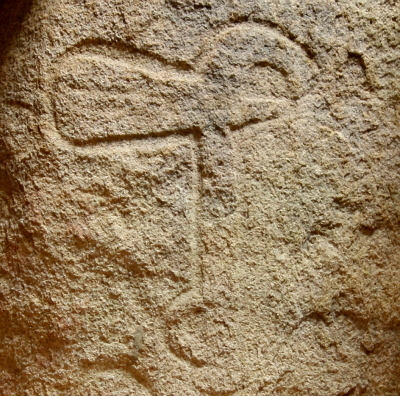 Moreover the stone axe was certainly also a symbol of power and so the carvings.